Dog ear infections can be painful! We owe it to our pets to understand what causes infection and how we can spot the symptoms to help us make our dog's ear problems a thing of the past. Read on to discover how to tell if your dog has an ear infection. It's a well-known fact that Cocker Spaniels often suffer from ear problems, especially if they're not checked and cleaned on a regular basis, but do you know what to look for? Well, there are a few classic signs that may indicate a problem and by checking your Cocker's ears often you'll be able to deal with an ear infection sooner rather than later, long before it becomes a serious problem! a change in your dog's behaviour, ie depression, irritability or lethargy. If you notice one or more of these symptoms in your pet, it's probably a good idea to take him to see his vet who'll be able to confirm your suspicions. It's best not to clean his ears before you see the vet. If you do, you'll be removing any visible evidence of infection, which will only make it more difficult for your vet to make a speedy and accurate diagnosis. I certainly don't recommend that you try to diagnose or treat the problem yourself. Dog ear infections can be quite tricky to diagnose accurately, never mind treat, and if you don't get it right, you may just be making matters worse. 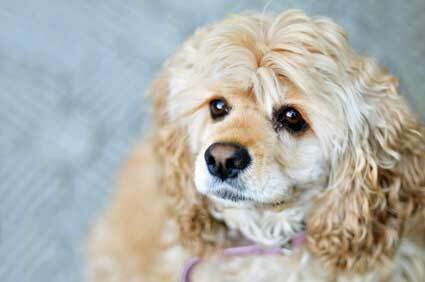 What Can Cause Dog Ear Infection? There are many things that can cause ear problems in our dogs, but one of the main causes is an increase in yeast or bacterial growth, and believe me, your dog doesn't want a yeast infection in his ears. There are also many illnesses and diseases that can cause infection too, but one of the main culprits is water. If your Cocker's ears hold water after swimming or being groomed, bacteria will multiply (because bacteria love dark, warm, moist places) and that's when the problems begin! It's a good idea to clean your Cocker's ears with a gentle ear-cleaning solution and then dry them thoroughly each time he's been in contact with water. Allergies are another common cause of ear problems in dogs. Your pet may be allergic to pollen, grasses or even a certain food, all of which can manifest as ear problems. Parasitic diseases, such as ear mites, fleas and ticks can also cause ear infections, (as well as allergies) so it's important to treat your cocker for parasites regularly. A foreign body, such as a grass seed, can also cause an infection. Max has had many grass seeds removed from his ear. The vet removed 3 from the same ear only last month! Yet more expense. Oh the joys of being owned by a Cocker Spaniel! Most of the above ear problems can be avoided by keeping your dog's ears clean and dry to prevent bacteria from growing in the first place, unless of course the infection is simply a symptom of an underlying illness, in which case the illness will also need to be treated. 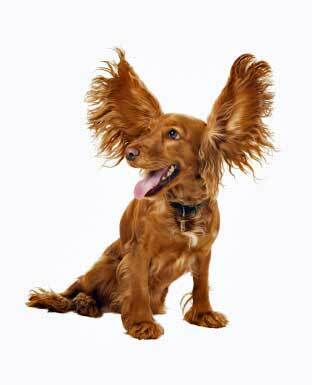 That's why it's especially important not to try and diagnose or treat your pet's ear infection yourself. Prevention is often better than the cure and cleaning your dog's ears regularly will help you to keep bacteria at bay, allowing your dog a better chance of avoiding infections altogether. Regular checks will also alert you to any potential problems sooner rather than later, which means your vet can diagnose and treat earlier before it becomes a serious problem. 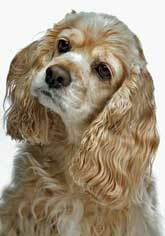 Cocker Spaniel ears need extra care so it's important to understand how to look after them properly and what 'general maintenance' tips we can follow to keep infection at bay. Click on the lovely Cocker Spaniel photo to learn more.